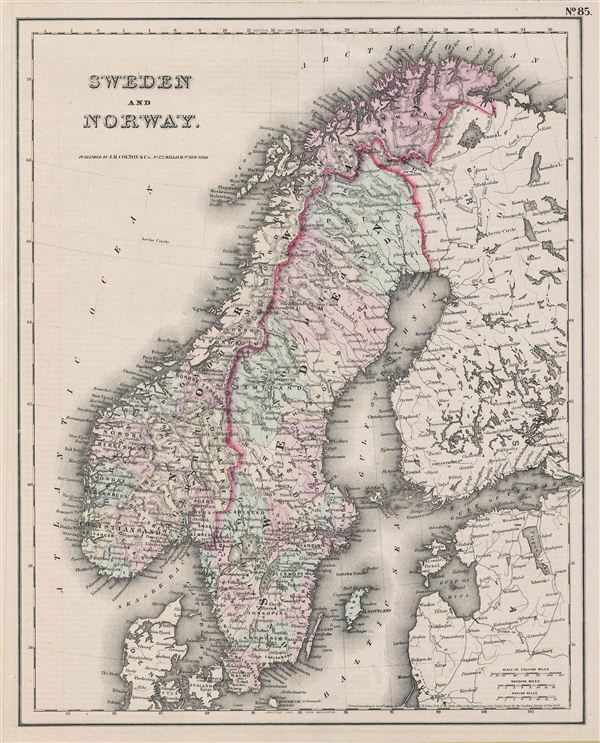 This is the uncommon 1857 issue of J. H. ColtonÂ's map of Sweden and Norway. The map covers from the Arctic Ocean south to Denmark and east as far as the Gulf of Finland. It also includes the modern day nations of Sweden and Norway, with part of adjacent Denmark and Finland. Throughout, Colton identifies various cities, towns, rivers and assortment of additional topographical details. It offers fine detail throughout with elevation rendered by hachure. Of particular interest is the legendary Lofoten Maelstrom in northwestern Norway. This legendary whirlpool was the inspiration for edgar Allen Poe's classic tale Descent into the Maelstrom. In reality, it is a periodic and powerful current caused by tidal variations in the region. Like most Colton maps this map is dated 1855, but most likely was issued in the 1857 issue of ColtonÂ's Atlas. This was the only issue of Colton's Atlas that appeared without his trademark grillwork border. Dated and copyrighted: 'entered according to the Act of Congress in the Year of 1855 by J. H. Colton & Co. in the ClerkÂ's Office of the District Court of the United States for the Southern District of New York.' Published from ColtonÂ's 172 William Street Office in New York City, NY. Colton G.W., Colton's Atlas of the World Illustrating Physical and Political Geography, New York, 1857 (First Borderless Edition). Very good. Blank on verso. Minor stains on margins. Offsetting.